Mahan Hazarika: Please tell us in brief about what new is happening at Uflex aseptic business. Ashwani Sharma: Uflex‘s aseptic business is the first Indian leading manufacturing business that offers universal innovation of holographic effects. The journey so far has been remarkable, as we have been able to sell laminates to all segments. Our holographic packs are buzzing strongly in the domestic market and putting a confident foot forward in the International market as well. In the domestic market, the holographic effects have accomplished resonance with leading brands like Fresca Juices (Fresca Foods Pvt. Ltd) and Juceika (SMS International Beverages) who have been launching all their juice variants in Asepto holographic packs. The wave of holography is shaping the domestic packaging market and brands are looking forward to opting holographic options with a motto to stand out on the shelves. Uflex is committed to the principle that all customers and stakeholders should expect consistent, outstanding service and quality products from the company. It is extremely busy period for Asepto as we are not simply moving on from approaching the global prospects, but also making strides to continuous improvement into our range of innovation under the name of Uflex’s brand Asepto. 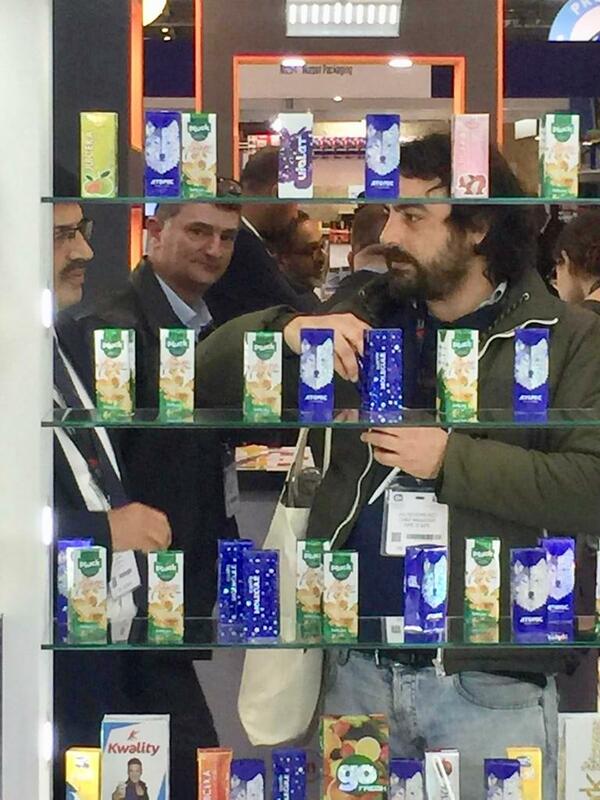 We have recently concluded our participation in the Pro2Pac, London, UK show by displaying the cosmic Asepto premium with Foil stamping and Lens effects in aseptic packaging. The packs emerged as head turners and several brands in the UK and other regions have shown great interest in the never seen before effects on aseptic packs. That is exactly our vision – from day one we wanted to revolutionize aseptic liquid packs by enhancing the aesthetic appeal. We already have customers in our bouquet to whom we have sold aseptic packaging domestically and internationally, out of which we have also sold our world-class indigenous Asepto Smart 78 Filling machines. This holographic innovation marked the dawn of a new era in the aseptic liquid packaging business creating plethora of aesthetically stunning options for brand owners. Mahan Hazarika: How was the show Pro2Pac 2019? What made you decide to be part of this show. Ashwani Sharma: Currently, the EU market is majorly dominated by a global player and a few Chinese; offering similar products in aseptic liquid packaging. The total potential of the EU market is approximately 80 billion packs and there is ample scope in the market. It was time for us to showcase the unprecedented holographic innovation by Asepto from the house of Uflex to the EU market. On participating, the crowning accomplishments of Asepto Spark (Holography) and Premium (Foil stamping and lens effects) range were displayed which attracted visitors’ attention. The Steller effects of foil stamping, 3D Fresnel and Multi-lens made everyone stop by. The first of its kind aesthetic rejuvenation in packaging for juice, dairy and alcoholic beverages category uplifting the face of retail shelves in the EU region is necessary. There were professionals from renowned brands who visited our stand and were completely wooed by the impressive effects seeing on the packs. We are very sure of the strength of this transformational innovation in aseptic packaging, because we truly understand the merit of standing out of the clutter and the struggle to get noticed in an already inundated retail shelf. The visitors were majorly from the EU region, South East Asia and Africa. Mahan Hazarika: What are the key strategic priorities for the Uflex aseptic business currently? Product differentiation: Innovation to create value added differentiation is the guiding vector of our business. Asepto is a class example to prove our mettle in creating differentiation at the Point of Sale, a bonus to the liquid packaging industry. With the various kinds of never seen before holographic effects, multi-lens, Fresnel lens, embossing and foil stamping effects on aseptic packs is a revolutionary innovation. When we conceived this project three years back, we studied the liquid carton industry and what we realized is that there is obviously one global leader and there are two or three big companies. By and large, as a final product, the difference is only in shapes and sealing technology. But nobody is able to come up with packaging that makes the product look really different and attractive at the retail shelf because these days, packaging plays a significant role in attracting customers’ attention when the product is on the shelf. And that’s how we introduce our Holographic Innovation for the first time to the world of aseptic liquid packaging. Integration: The strong fundamental approach of Uflex enables it to create a holistic picture of packaging. We enjoy the distinction of being a total system supplier for the aseptic liquid packaging and exceeding global standards while reducing total cost of ownership. As a system supplier our offering includes from packaging material, design solutions and filling lines under the name Asepto Smart 78 and a strong technical support to our customers on the machine and spare parts side. Aseptic liquid packaging needs special technological skills and expertise. We deliver end –to-end personalized support, ensuring packaging material machine interface that includes assistance and maintenance of packaging material from concept till commissioning. Reliability on quality: We promise reliability on quality, assured timely delivery, efficient commissioning of projects in the shortest possible time with lowest capital cost, efficient operation of the plants with higher productivity, innovative packaging concepts, providing higher growth opportunities. In the short span of our inception, we have been able to obtain all the mandate certifications to ensure best quality to our customers. Together with official Indian standards, Uflex’s Sanand facility is certified in accordance with the International ISO 9001:2015, ISO 14001:2015, ISO 22000:2005 and OHSAS 18001:2007 management systems as well as the BRC Packing Issue5, Halal India Certificate, and SEDEX certified manufacturing facility, reinforcing our strong operational process and commitment for continual improvement. Global expansion strategy: Our focus at the moment is also to improve the global reach of our product. Once we offer them better services through our innovative products and services, we will be able to reap the competitive advantage. For the same we are actively participating in all industry’s best beverage packaging fairs to multiply visibility of our holographic innovation. Strong team: We do not rest our case on past laurels; however, with the strong infrastructure in the industrial hub of Gujarat in Sanand, we have deployed a very strong team of packaging professionals with a knack to problem solving skills, good attention to details and strong, technically skilled team. We are up skilling our people capability to step ahead in competition. Mahan Hazarika: How is Uflex holography division helping your aseptic business? Ashwani Sharma: While the packaging industry can only thrive on differentiation, we have carried out multiple roles to prove that we are ahead of the league. We are making the most of our in-house holographic and engineering prowess to stir up the monotony that has set in the retail shelves of aseptic packs globally. Be it any part of the world, the existing liquid carton packs have nothing new and enchanting to offer to consumers. Taking cognizance of this deprivation, Uflex has launched Asepto Spark and Asepto Premium range of packs. The spectacular products from Asepto, i.e., Spark and Premium, bring in the real innovation that differentiates us from another beverage packaging. This is only possible due to our depth in in-house holographic knowledge that brings out the never seen before mesmerizing novel holographic, multi-lens, foil stamping and embossing effects in aseptic packs, allowing myriad possibilities to market the packs. Our strength lies in the backward integration strategy that we have adopted to propel the innovative packaging venture. Uflex firmly believes that, in the next decade, packaging will transform the way the point of sale zones are being looked at in the India beverage industry. Mahan Hazarika: Is Asepto going to be the main growth driver for Uflex in coming days? What are your future plans for the aseptic business in terms of: infrastructure, manpower, and investment? 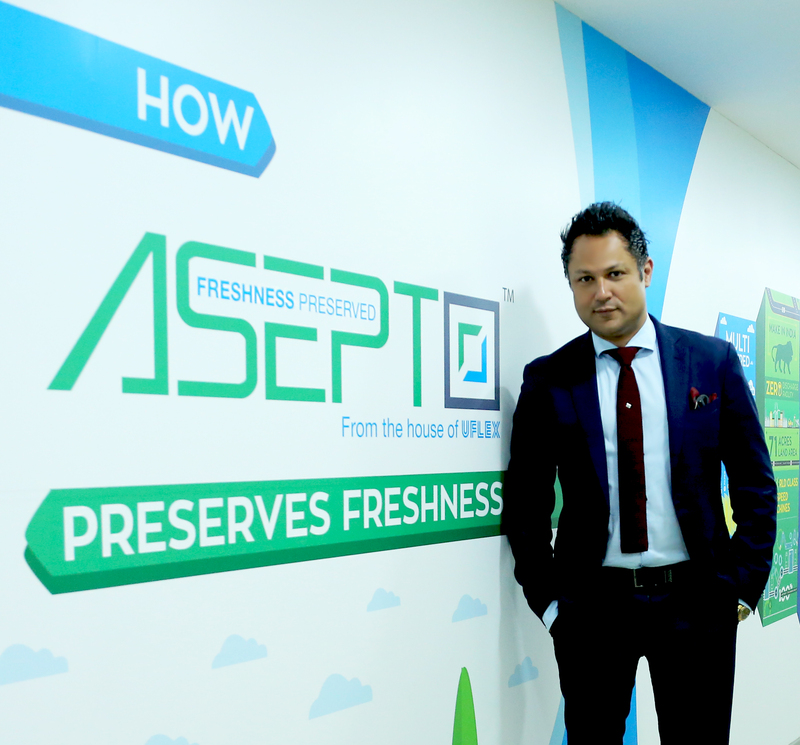 Ashwani Sharma: Asepto will be a key growth driver for Uflex’s business in the coming years. The investment towards the aseptic packaging plant is INR 580 crore (approx. US$ 85 million). In the first phase it has the potential to employ about 250 people. Our total investment over the next 2-3 years is INR 1200 crore in a phased manner. This already includes INR 580 crore towards setting up the aseptic packaging manufacturing plant. The manufacturing plant is built on 21 acres of the 72-acre land parcel that Uflex has bought at Sanand, Gujarat. Remaining land may cater to any future expansion of Uflex’s existing business as well as for aseptic packaging manufacturing as the need be. Upholding our commitment towards environmental sustainability, the aseptic packaging manufacturing facility has been designed to be a zero discharge plant. Mahan Hazarika: Please share with us about the Indian aseptic packaging market? What are the growth pangs that may need to be addressed? Ashwani Sharma: Presently the Indian aseptic liquid packaging market is growing at the rate of 17-18% per annum and the market is expected to double up in the next five years to approximately 20 billion packs per annum. Drawing parallels to China that boasts a tremendous growth story, having already reached approximately 80 billion packs, India with a similar population offers growth potential that is very large. With Uflex having entered into the aseptic liquid packaging manufacturing is the ‘big thing’ for taking Uflex’s brand Asepto to the next level of business excellence. Mahan Hazarika: How is the world aseptic market doing so far? The dairy segment stands out as an encouraging segment, should the packed milk market switch to 10% in aseptic packaging will lead to optimum volumes reaching end consumers riding on better packaging. This will change and uplift the face of the segment, opening a large market opportunity. The future, thus, is likely to be extremely bright.